→ Find out what stories we’re looking for today. The northeast forged our heritage. What we sell, the gear we make, the values we cherish, who we are: all of it comes from experiences among granite, spruce, birch, mud, mosquitoes and friends. No, the wild, tree-flanked summits may not be as high and the enclosed trails are poorly trodden, but they’re what we call home. Our home. These calm, isolated lakes are what we have come to know and love, and it’s landscapes like these that remind us that we are all a part of something bigger. And we may spend every day among these places, but every day we’re still surprised and left in awe at a piece we’ve never seen or known. Nevertheless, it’s not about the destination. It’s about the footprints we’re leaving on the trail and the imprints it’s leaving on us—and this place leaves some pretty big ones. So let’s gear up, get out, and #GoEast! 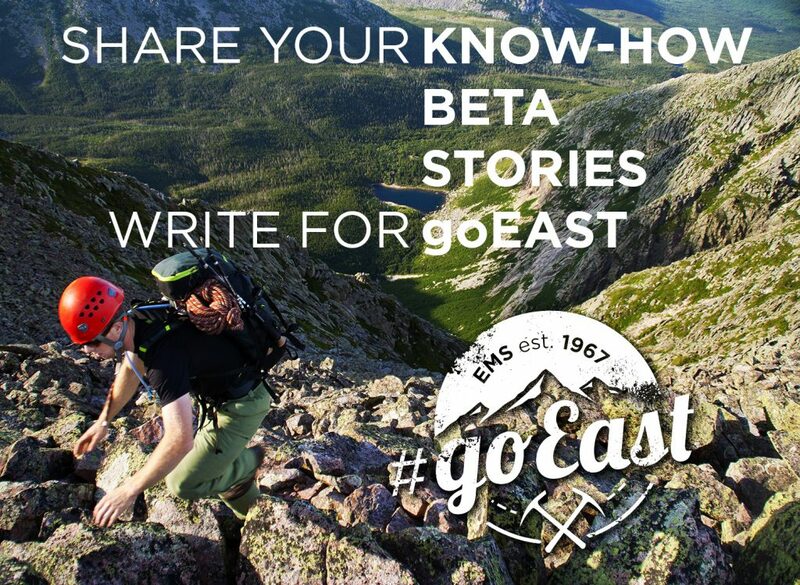 The goEast Community is here to help our readers and customers do just that by being the source for outdoor inspiration, beta, news, and stories. We’re the Northeast’s great virtual campfire. But we need your help and writing skills to do it! You’re the industry experts so we want to share your stories, your expertise, your passions, and your thoughts with our readers! And it’s way easier to be a part of than you think! Pitching stories (sending us the idea that you want to write about, how you want to write it, what it would include, etc.) is encouraged! It’s preferable to simply writing an entire story for submission. With pitches, we’re able to work with you to make sure—before you take your time to write it—that it fills a hole we’re looking to fill and it’s correctly written and formatted. We don’t want you to waste your time! Send your pitches, as well as any questions, comments or concerns to our Editor, Ryan Wichelns, here. When we receive pitches, we will work with you immediately to determine the story, provide feedback and give you a deadline, if necessary. It’s possible that we will edit and work with you on your submission before it is accepted. Once any story is accepted, either on deadline or off, you give Eastern Mountain Sports exclusive publishing rights of that story, with your clear identification as the author, as well as the ability to edit and alter your story in any way we see fit. For more details, see here. Writers submitting content of any kind agree to these terms and conditions. We want to keep our writers adventuring—It keeps you happy, gives you even more to say here, and adds to goEast’s deep pool of experience and expertise! Starting with articles published in October 2017, contributors* will receive Eastern Mountain Sports gift cards for their work. Short posts of roughly 200 words or less, quick news pieces, blog posts, videos, etc. (Tier 3) earn a $50 gift card each. Average posts of roughly 500 words, most listicles, gear highlights, location guides, etc. (Tier 2) earn a $75 gift card each. This tier makes up roughly 90 percent of the content on goEast. Longer posts of roughly 900 words or more, longer features, Alpha Guides, special assignments, etc. earn a $100 gift card each. All payouts are left to the discretion of the editor, based on the amount of work involved, time needed and more. If you have questions about which tier your article will fall in, ask the editor before you write an article. Gift Cards for an article published during any month, will be mailed out at the beginning of the month after it publishes. I.e., If you write an article in September that gets published in October, you’ll receive your gift card in the beginning of November. *This only pertains to contributors who are not currently Eastern Mountain Sports or Bob’s Stores employees. EMS employees who contribute to goEast are eligible for a $75 (Tier 3), $150 (Tier 2), or $300 (Tier 1) bonus (pre-tax) added to their paycheck. Email us for more details. We want our site and your writing to be the definitive source for high quality, accurate information for our readers, which is why we’re coming to you—the expert outdoor enthusiast—for your help and knowledge! Being passionate about the outdoors, the Northeast, adventure and whatever you’re writing about is far more important to us than whether or not you’ve been published in the Paris Review, Outside Magazine or anywhere else for that matter. You’re the ones who have been out there and done it which makes you the best people to write about it! That being said, we’re choosy about the information we publish and the people who write it. We hold every piece to a high standard and we’re willing to work with you to get your writing to that level. EMS goes local! These are largely “Guides” to specific regions, localities, hikes, trips, etc. within the Northeast. These have a strong informational and educational component and combine to make an ever-expanding Northeast outdoors guidebook, written by the experts. While entertaining stories are great, these must have a strong educational component around their location—more than just a setting for the story. If you were to go someplace for an activity, these should give you plenty information on how to do it. Length and style can vary but because they don’t focus on a story, longer posts will be rare in this category. Gear can sometimes be the most exciting part of adventuring outside, right? Here’s your place to talk about it! We’re not looking for reviews. Instead, we want suggestions for what to pack for a day hike, tips for maintaining your muddy boots, how to use gaiters, what to look for when making your next sleeping bag purchase, etc. We want to teach people about how to use their gear! Gear education: When should I retire my gear? The people are what make the outdoors really great. This section is full of their stories—and your stories! These can be personal anecdotes, features of impressive adventurers, Q&As with cool people, opinion pieces and more. Length should be in the medium to long range, very few will be short. It’s possible to have some overlap between MyAdventures and other sections depending on the content of the story. One of the biggest benefits we can have for each other as a community is the opportunity to learn from one another. This is the place for that. The Learn category can include any tips, tricks, skills, how-tos or explainers to help make out adventures better (and that don’t have to do with gear or specific locations—those fit in the Upper-Right or Gear 411 categories). See some breaking Northeast outdoor news? We want to tell our readers about it! These should be very current, if not breaking, and have some Northeast component. Always pitch the idea rather than simply write it! See a cool video that you think our readers would enjoy? Pass along the link for us to share every Friday! Watch for more specific story ideas and topics to be posted here, sharing the types of stories and articles we’re hoping to publish and share at specific times. You’ll be able to use as a guide for topics and inspiration! These ideas are not all-inclusive, if you can think of a way to improve it or a different idea altogether, throw it out here! And if you’re interested in writing any of these, get in touch before someone beats you to them! “Kitted Out” will be an ongoing series and a chance to include specific items, so be thinking about other iterations. Lots more hiking in the mud, cleaning gear off, waterproofing things, etc. Be sure to search goEast to make sure we haven’t already published your idea! Others: Women Who Crush It, backpacking and camping recipes, outdoor photography tips and guides, DIYs, videos, and news. Great photos are essential to having a high quality piece of writing. We won’t accept a piece of content without them! All stories, upon submission, are expected to include a minimum of two high quality, high resolution (1400 x 600px minimum) photos to go with the story. Landscape photos are best! You must also have taken or otherwise own these photos and have legal permission to give them to us for use. These guidelines will help us maintain a consistent level of quality and a constant voice throughout our content, but also allow your personal voice to shine through loud and clear. We want to have conversations with our readers, not talk down to them. Think of this as a virtual EMS store. You walk in on a Friday night before your big trip, pick up a couple last minute items and, at the register, strike up a conversation with one of the guides who asks you where you’re going then proceeds to recommend the best leantos for you to stay in. Except here, you’re the store guide. Show the reader how enthusiastic and excited you are about what you’re telling them, how much you love your outdoor experiences, and how much of an expert you are. Leave them with little doubt that you knew what you were talking about. These are guideposts for readers. They help deep readers stay on track, and help scanners find the content that they find most relevant. Use them, not merely to break up content, but to orient people for what’s coming next, and keep them engaged. In headings, use title case, capitalizing everything but conjunctions, prepositions, and articles (unless any of these start the heading). Periods aren’t good for headings, but a question mark can work wonders. In subheadings, use sentence case, capitalizing only the first word. Lists are great and make some things far easier for readers to get through and make sense of. Be sure that your list follows a consistent syntax, so it doesn’t look disjointed. Whenever possible, always try to supply one photo for each corresponding item in the list. Capitalize only the formal names of places and events. If you need a formatting cue for emphasis, then choose italics, but use it sparingly. There is, however, an exception: using italics for the names of published books, periodicals, newspapers, major works of art, and full-length film titles; unpublished works, minor works of art, and television shows should be set in quotation marks. Generally speaking, we like them because they’re conversational. But if one in particular is not broadly familiar to readers (especially in the case of some acronyms), then spell it out the first time you use it in a piece. Never abbreviate Mount or Mountain (Mount Washington, not Mt. Washington). It’s okay to start—or end—sentences with and, but, and or. But don’t feel that you have to. There is only ONE space after a period, not two. Two spaces was the rule back when typewriters were used, but not with computers. If you do it, get familiar with the Search and Replace feature before you submit it. Em dashes help give readers a natural pause in their reading—and they can be used to set off a parenthetical statement. However, they shouldn’t have spaces around them, and two hyphens do not make an em dash. We see them as a bit of a writing crutch. In a hyped-up world, good writers can communicate enthusiasm and emphasis, perhaps even more strongly, without using exclamation points. Please avoid. Capitalize north, south, east or west, only if it’s used in reference to a proper region. Take the trail north, but we live in the Northeast. When referring to another website, link as appropriate. Remember, in today’s SEO world, links to other sites are great! But don’t link from words like “Click here” or “To learn more.” Instead, write as you normally would and then simply highlight and link the most relevant keywords. And be sure to click the “open link in new tab” option when it’s available. Without turning your entire story blue, linking to product on EMS.com is great! Try to have at least one or two products somewhere in each story. Use and then link the full name of the product, as it appears on EMS.com. With product-based listicles, do not turn the subhead into a link. Restate the product and place the link in the first sentence of the text. And, obviously, don’t link to product outside of EMS.com. There might be exceptions, but they really are exceptions. If you have questions, ask the Editor.